Amazon.com description: Product Description: It's been the worst financial and economic crisis since the 1930s and we're not through it yet. For banks, it's been a debacle like no other. To keep banks alive, $15 trillion of financial aid has been pledged to them by taxpayers - that's more than $2000 for every person on the planet. But believe it or not, it could all have been even worse, an economic Armageddon. If the old capitalism failed, have we really learned anything? Or are we frantically trying to return to our bad old business ways? In the West, we've been living beyond our means for years. Do any of us in the US and UK really understand the painful implications of the new economic reality, that we can no longer borrow as much as we'd like to maintain our living standards? 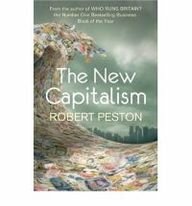 In Who Runs Britain, Robert Peston warned that there was a serious economic storm on the way. Now, in The New Capitalism, he exposes the naivete and complacency of bankers and the authorities when confronted with the unmistakable signs that calamity was on the horizon. Peston will also show how the onset of that storm has changed the economic landscape forever and what that means for all of us - the jobs that will be available, the skills we'll need, how we'll save, how our banks and big companies will be run, the new compact between the public and private sectors. Just like Who Runs Britain, this is a book we can't afford to ignore. About: It's been the worst financial and economic crisis since the 1930s and we're not through it yet.